APPEARANCE: The maneki neko is a popular variation of the bakeneko which brings good luck and fortune. It is most commonly seen in the form of decorative statues in homes and stores. It is depicted with one or both paws in the air in a beckoning motion. ORIGIN: Cats have long been connected with the supernatural in Japan. While some superstitions link cats with bad luck, curses, and strange fires, there is also a long tradition of cats being revered and seen as good creatures. Particularly in agricultural and sericulture, where cats would eat mice and other pests who attack crops and silkworms, cats were seen as lucky creatures, and images of cats were used as charms. Statues of maneki neko became popular items in the urban areas of Japan towards the end of the Edo period. Cats with their right hand raised are said to bring economic fortune, while cats with their left hand raised are said to attract customers. The cat’s colors of the can be significant as well. Long ago, black cats were said to be lucky cats due to their ability to see in the dark, and so black maneki neko were used as talismans against evil spirits. Red was believed to repel smallpox and measles, so red maneki neko were used as talismans against sickness. The origins of these statues lie in folkloric tales about strange cats who bring riches to their masters, or who save their masters from disaster. There are a number of famous stories based on variations of these themes. 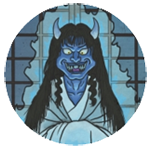 LEGENDS: In the Yoshiwara please district of Edo, there lived a very famous courtesan named Usugumo. Usugumo was a tayū (the highest rank of oiran) in the esteemed brothel of Miura Yashirōzaemon. 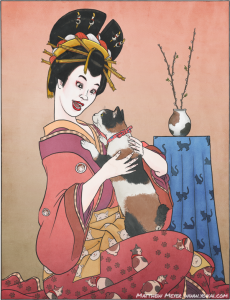 Usugumo was a cat lover, and was particularly fond of her tortoiseshell cat whom she always carried with her wherever she went. So great was her love for her cats that rumors began to spread that Usugumo had been possessed or bewitched by a cat. One day, as Usugumo tried to visit the bathroom, her tortoiseshell cat began acting extremely clingy. It refused to leave her side, clawing at her dress and meowing noisily. Seeing this, the brothel owner thought that the cat was attacking Usugumo. He quickly drew his sword and slashed at the cat. The cat’s head flew through the air into the bathroom, and sunk its teeth into a large venomous snake which was hiding out of site near the toilet. Usugumo was overcome with grief for her pet cat, which even in death had saved her life. To ease her sadness, the brothel owner had a statue in the likeness of her cat made by the finest woodcarver out of the finest wood. The carving was so masterfully done and so lifelike that Usugumo was overjoyed and was able to find her happiness once again. Everyone who saw the carving of the cat wanted one just like it. That year, copies of the figure were sold in the Asakusa markets. This is often thought to be the origin of the maneki neko statue.